In chemistry things might go bang or smell bad, but if you have had the right training this should only happen when you want it to. If you are interested in experimenting in the laboratory, working on issues in chemistry, and producing and analysing materials, and if mathematics and physics are not a problem for you, the Chemistry degree programme at FAU could be the right choice for you. You will learn the essential theory and methodological skills in all of the sub-disciplines of chemistry. These include disciplines that only play a minor role in school, such as physical chemistry (describing the characteristics of materials in relation to laws and concepts of physics; spectroscopy and other important investigation methods) and theoretical chemistry (developing models and methods in order to understand chemistry better). 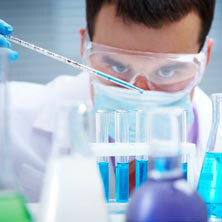 Chemistry is one of the main natural sciences and plays a key role in both research and industry. A great deal of advancement and innovation is based on discoveries made in chemistry on a molecular level. New materials and ingredients that improve our everyday lives and quality of living are developed in chemical laboratories – such as the ingredients for new cancer medication or new materials for more powerful solar cells. Chemistry helps shape the future. Good knowledge of chemistry is in high demand in many areas. Mathematics and physics are essential. These two subjects are a key part of the degree programme in the first year and later on you will still have to deal with equations. You need to be determined and patient, even when things don't work the first time. Preparing for lectures and doing follow-up work can also be hard work sometimes. During the semester breaks there are no lectures but there are still examinations during this time. The semester breaks are also usually when you complete work placements. Der Studiengang Chemie ist aktuell zulassungsfrei (NC-frei) und kann nur zum Wintersemester begonnen werden. Die Beantragung der Immatrikulation erfolgt normalerweise zwischen Anfang Juni und Ende September online über www.campo.fau.de.